Try Unique, Unusual & Delicious Chocolates from Chuao Chocolatier! Are you looking for a new way to satisfy your sweet tooth?? Then let me recommend one of my favorite online chocolate shops: Chuao Chocolatier, who offer unusual, unexpected and DELICIOUS chocolate! Maybe you are looking for a unique wedding gift. Or maybe you are looking for something sweet to end your special wedding night. 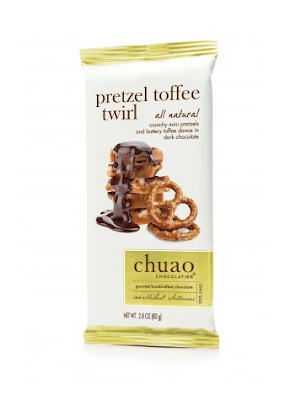 Then Chuao Chocolatier is perfect! They offer tons of bonbon collections, truffles, and wine pairings that any happy couple would be delighted to end the night with! 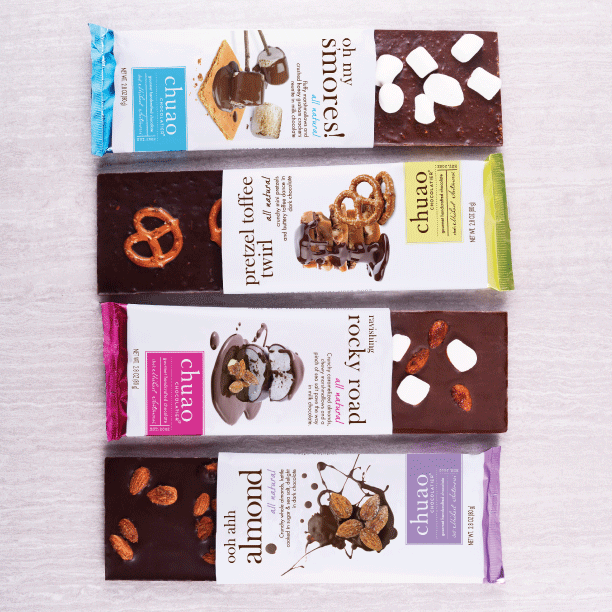 Few things are as comforting and oh-so-satisfying as the creamy sweetness of premium milk chocolate... and this collection is no exception. So, put your feet up, take a bite and close your eyes. This is a moment to be cherished. Every small batch of Chef Michael's soft caramel is made by hand, in the well-loved copper pots of our tiny kitchen, in flavors ranging from the traditional to the tropical. One taste and you'll know, your chocolate wishes and caramel dreams have come true. 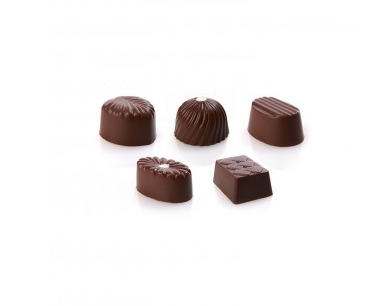 These caramel bonbons are absolutely AMAZING and each one was delicious, smooth and creamy! I couldn't stop at just one! Let me introduce you to a chocolate bar you probably have always dreamed about as you ate breakfast! And, since the only thing better than cereal is cereal and chocolate, they've kissed this decadent milk chocolate with sweet nibbles of crushed, all natural cinnamon toast cereal. This bar is made from scrumptious cinnamon toast cereal spooning in milk chocolate. 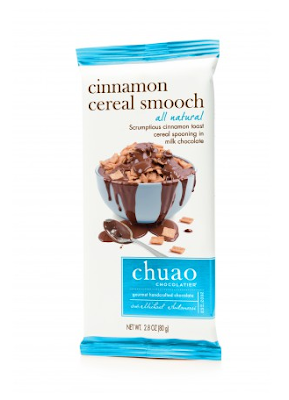 So, don't be shy; lean in for your Cinnamon Cereal Smooch! 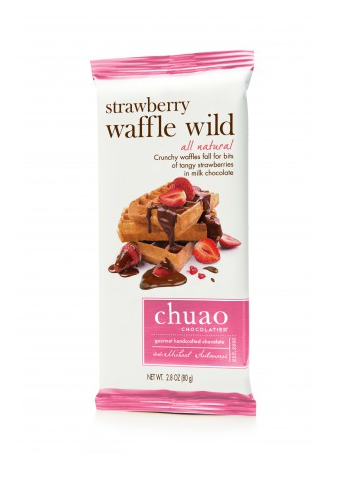 And if you love Strawberry Waffles, then this bar is for you! This bar is made with crunchy waffles and bits of tangy strawberry in milk chocolate. This one was one of my husband's favorite because he LOVES strawberries and waffles! This was so unique and tasty at the same time! 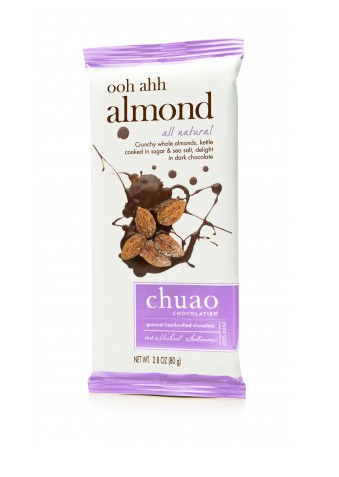 And if you love almonds, like I do, then you will love this bar! 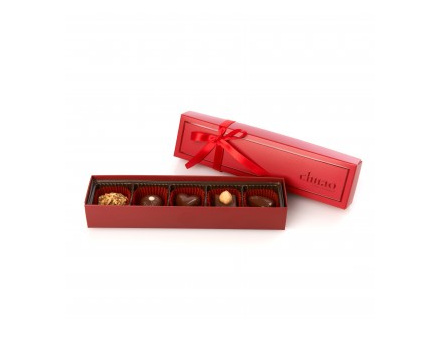 It includes crunchy whole almonds, kettle cooked in sugar & sea salt in dark chocolate. Salted, caramelized almonds tickle our fancy in silky, rich dark chocolate. Treat yourself to a mouthwatering "me" moment. I love the Non dairy, vegan friendly, non GMO ingredients and this bar is perfect mix of sugary and salty! I LOVE Toffee! So when I saw this bar, I knew I would love it! And I did!!! This bar includes crunchy mini pretzels and buttery toffee dance in dark chocolate. It is handcrafted with ethically sourced cacao and all natural ingredients! And if you want just a little bit of salty with the sweet, you will love this one! 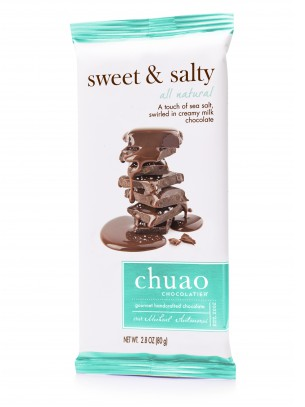 It features a touch of sea salt swirled in creamy milk chocolate. I finished this bar off after dinner tonight and I Just. Couldn't. Stop! It was the perfect mix of sweet and salty and it is so creamy! You can purchase Chuao Chocolates from Chuao Chocolatier online store.